The end of your lease term with Howard Carter Lease Ltd doesn’t have to mean the end of your driving experience in your vehicle. Options await as you decide on your next steps in the leasing process. Let us help guide you through the End-of-Lease process, and find selections that best fit you. 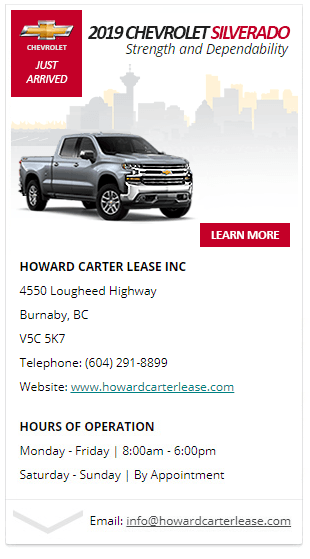 From communicating to you before your term is due, to the turn-in and inspection processes, to your options once your lease has expired, Carter Howard Lease Ltd is there with you every step of the way. From getting behind the wheel of a brand new vehicle to purchasing your lease, learn what choices you have as your end-of-term date nears. Are you ready for your next vehicle? Visit your nearest Howard Carter Lease Ltd to test drive the vehicle that’s right for you. This is also a great time to discuss excess mileage and your vehicle’s condition. Return the vehicle to Howard Carter Lease Ltd. Remember to bring your owner’s manual, extra set of keys and any other accessories that came with the vehicle.